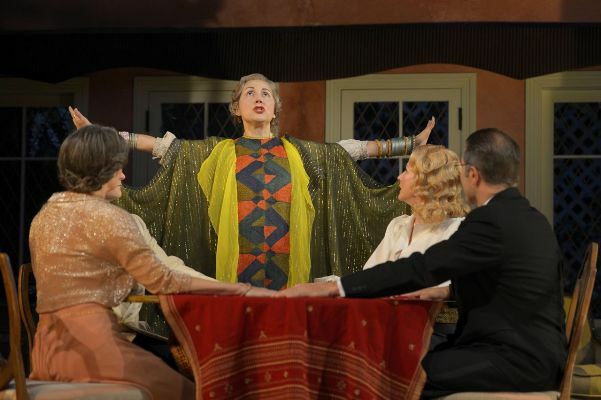 Blithe Spirit, CalShakes, Orinda, Calif.
It’s not your ordinary ghost story. Which means it’s quite funny and sophisticated and not the least scary. Noël Coward’s “Blithe Spirit” has been rattling tables and slamming French doors since 1941 — most recently in a Broadway revival starring Angela Lansbury as the eccentric medium Mme. Arkati — and probably will continue to do so for a while in spite of the fact that, while one of his most popular, it is not one of his best plays. It has the repartee, the one-liners, quips and aphorisms honorably descended from Oscar Wilde and Shaw. It has the martinis (as well as seemingly endless cups of tea). But, for me, it never has had quite the verve of “Private Lives” or “Design for Living.” Perhaps that’s because, for this one, Coward, the famous socialite, has descended from the upper crust down into the depths of Kent and the middle class. Nevertheless, in a fast-moving, well-acted production directed by Mark Rucker at CalShakes, it sparkles — perhaps not like the finest champagne, but a good solid English lager. “Spirit” is a sendup of the vogue early last century for spiritualism, calling up dead spirits by means of mystical arcane rituals. But underneath that it is an indictment of love and marriage, which according to Coward’s playbook, are not necessarily the same. As such, it will strike some as mean-spirited; others as all too sadly true. Charles Condomine (a marvelously dry Anthony Fusco) is a writer of mystery novels, a one-time widower, remarried for the past five years and living outside of a village in the aforementioned Kent in blissful, bucolic self-absorption. For presumed research on his next novel (but really for laughs) he and his wife, Ruth (the always luminous René Augesen) have invited some people in for dinner and an evening of spirit-summoning. They include the local physician (Kevin Roston), a stolid skeptic, and his primly provincial wife (Melissa Smith) as well as the star attraction, the medium Mme. Arkati (Domenique Lozano in swirling shawls and inexplicable hats — period-perfect costumes by Katherine Roth — hilariously sparkling in what might well be the role of her career). Completing the household is a bumbling and not-too-bright housemaid (Rebekah Brockman in a too-broad characterization), who seems extraneous but will be instrumental in bringing about the denouement. Mme. Arkati’s séance is a rousing success in every sense of the term, conjuring up the spirit of Charles first wife, Elvira, who, although no one but her husband can see or hear her, takes up residence in the household and proceeds to turn it upside down. Jessica Kitchens, looking a little like Marilyn Monroe in a clingy white gown and platinum wig, does the role proud. She’s a spiteful, if charming, ghost – determined to get Charles back at all costs. The second act is something of a battle of wits between the two women, with the man as a hapless foil caught in between – and rather enjoying the attention. Ruth is a sensible country wife (“Careless rapture at this point would be incongruous,” she coolly observes) while Elvira is a flirty, frivolous sexpot, and their rapid-fire repartee is delicious. Director Mark Rucker, in addition to keeping things humming onstage, interpolates some nice touches: the stagehands who rearrange things on Annie Smart’s stylish suburban set are dressed in maids’ uniforms and the song that keeps playing on the gramophone is “Always,” which, when you come to think about it, is a commentary on the theme of the plot. Doors open and close, tables rattle and the wind comes up right on cue. “Blithe Spirit” may not have the depth of the Shakespearean offerings usually center stage at CalShakes but it has style. And isn’t that what Noël Coward was all about?